When we last wrote about this developer, Milind (our ex-editor) proclaimed that Aleksandar Vacić made beautiful apps by default. So when I received an early-preview of Banca, I wasn’t surprised at all. Banca is a simple and elegant currency convertor from Radiant Tap (previous known as code•aplus), Aleksandar’s design and development studio. He’s previously brought us apps like Couch to 5k, Guerrilla Cardio, Run Mate and Quickie. All of these apps have one thing in common, something that I’m personally a big fan of, and that’s elegant design. There’s no overdone glossiness, no shiny elements. The design compliments the function. The app is extremely easy to use. Currencies appear horizontally on the screen and changing between them is as easy as scrolling left or right. You can even change the currencies once you have typed in the digits. 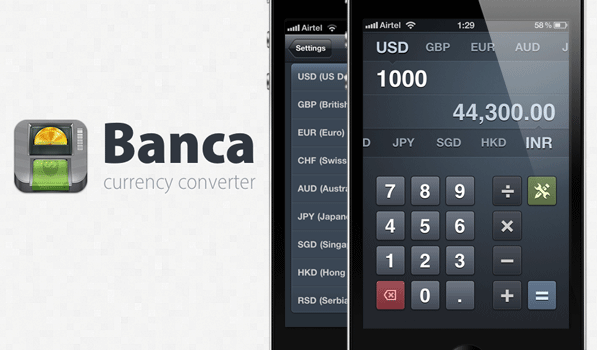 Banca also comes with the ability to do basic calculations. It supports a huge list of currencies and you can select which ones show up in the list. Banca comes highly recommended from me and is currently available at just $1.99 (50% off) until August 8th, after which it’ll sell for $3.99. Here’s a video of the app in action on Vimeo.